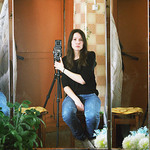 Albina Shaymuratova was born in 1988 in Moscow. From 2012 has studied at the Rodchenko School of Photography and Multimedia, in the documentary photography studio of Igor Mukhin. In 2013, participated in a group exhibition in Izhevsk concluding a seminar held in Udmurtia; in 2014 participated in the Radar group exhibition (Galerie Ernst Hilger, Vienna). Lives and works in Moscow.